The stock market’s feverish fall Monday afternoon, punctuated by a nearly 1,600-point intraday drop for the Dow, immediately struck fear in the hearts of many investors and prompted them to reassess their portfolios. But let’s get real. This is no time to panic. To be sure, a blizzard of experts in recent weeks have warned that a correction, or 10% drop, was not only overdue but normal and just a matter of time. Even as the Dow Jones Industrial Average broke through the 25,000 benchmark on its way up and galloped past 26,000, the market refused to break stride. 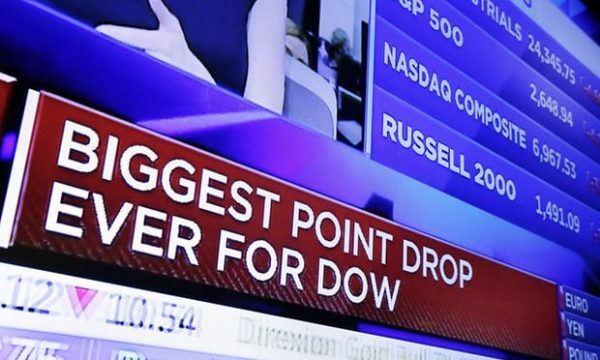 But while Monday’s sizable point drop was scary, especially because it came after Friday’s 666-point drop, the stock market’s gains in recent years remain strong. And experts say it’s critical not to overreact in the moment. That’s a one-way ticket to losing a fortune. Instead, take a breath and carefully consider your options. For starters, the Dow quickly recovered some of the day’s losses and closed down 1,175.21 points, or about 4.6%, to 24,345.75. That’s still bad, but keep it in perspective. The percentage drop matters. At its worst point Monday, the Dow was down about 6.3%. By comparison, the market lost 22.6% in 1987’s famous Black Monday sell-off. So it could be worse. If you completely exit stocks now, you may miss out on potential gains ahead. Economists remain bullish on growth. “We expect fiscal policy, financial conditions and firming global outlook to support strong economic growth” in 2018, Nomura economist Lewis Alexander said in a recent note. Experts have been predicting a correction. From the Dow’s peak of more than 26,000 in late January, it would take a 2,600-point drop to hit that 10% level. Alan Skrainka, chief investment officer for Cornerstone Wealth Management, has been predicting that’s what will happen this year. 2. Consider buying the dip. Should you take advantage of the dip to buy more stocks? The bull market is showing its age but the good times may not be at an end. The nation’s unemployment rate, at 4.1%, is at the lowest level since December 2000. The tax-cut package delivered some of the biggest gains to corporations, and the benefit to profits is likely to support stock prices through the rest of the year. But if you decide to snap up shares at lower prices, be selective, advises Joe Quinlan, chief market strategist for U.S. Trust. Consider your tolerance for risk over the long run, because your nerves are going to be tested as the market gets bumpy amid rising long-term interest rates. In the U.S., Quinlan sees opportunity in financials, health care and industrials. Looking abroad, he favors stocks related to the e-commerce boom in China and robotics production in Japan. 3. Or wait and watch. The market may rebound in a big way following the recent turbulence, but it may take time. Sam Stovall, chief investment strategist for CFRA, on Friday predicted further declines before stocks stabilize. That prediction played out Monday. Given that the market has gone so long without a major setback, investors may be leery about jumping back in right away. 4. Realize the sell-off may be a blip. Since 1900, the U.S. has seen 125 corrections of 10% or more, which is about one a year. Yet the market has always gone on — and eventually up. Since 1980, the stock market has had positive annual returns in 28 of the last 37 years, Skrainka points out. Remember that Monday’s drop follows a 25% rise in the Dow last year. “A 3% to 5% decline doesn’t scream ‘buy’ or ‘sell,’ ” said Stephen Janachowski, CEO of Brouwer and Janachowski, a wealth management firm based in Mill Valley, Calif.
Investors who are already invested should take a deep breath and sit on their hands, he said after Friday’s drop. Those who were looking for an entry point can gradually buy into the market if it falls further.